While there are lots of different factors that make up a great piece of art (color, texture, finish, etc. ), for acrylic pouring, no single aesthetic feature is as sought-after as cells. Cells create the distinctive look that instantly marks a piece as an acrylic pour. They’re both one of the toughest parts of the process to master and one of the most rewarding! Silicone, as most experienced pour artists will tell you, is the key to creating dynamic cells in your paintings. While technique can certainly make a difference, it mostly comes down to using the right materials. You need to use the right mix of paints, mediums, and additives—specifically silicone—to create a space for cells to form. In this guide, we’ll explain why we love silicone so much and outline the different types available to you. We’ll tell you which ones we’ve found to work best, and give you some general advice for using silicone in your pours. Let’s get started! Why Use Silicone in the First Place? There are several different dynamics that need to occur in your paints for cells to form. You need the paints to be flowing smoothly, for one thing. That’s why we always start by mixing paints with a good pouring medium, such as Floetrol or Liquitex. To learn more about pouring mediums, check out the guide we’ve written all about them. The better your paints are flowing, the better you’ll be able to create all kinds of effects, including cells. 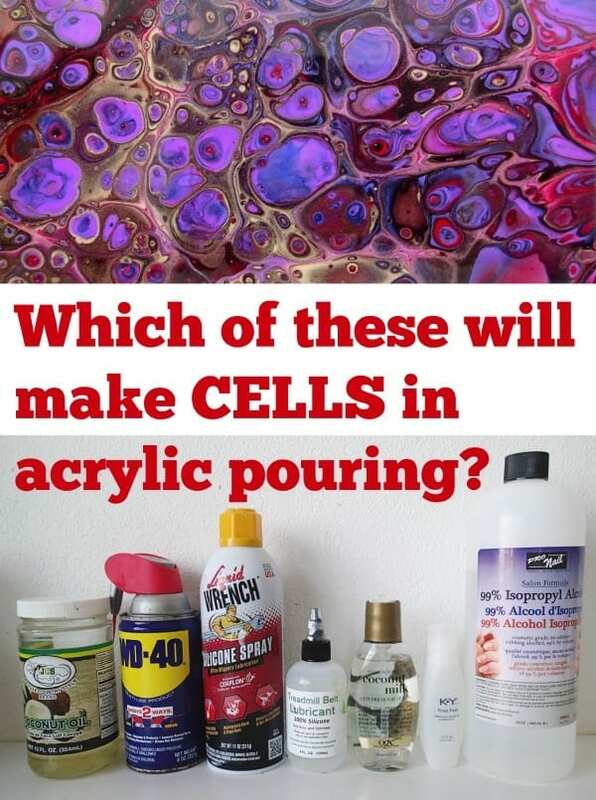 You can certainly get some cells using just a pouring medium (and perhaps a splash of water), but most pouring mediums bind too well to the paints. Since they’re designed to maintain as perfect a consistency as possible, they don’t usually create the layered separations and sliding effects that produce the most striking cells. However, they definitely help you get there! Pouring mediums also extend drying times, which gives you more opportunity to work with cells once they’ve formed. And Floetrol helps to level the craters of the silicone, so you get the look without having such an uneven texture at the end. What you really need to get those killer cells is something that doesn’t mix well with your paints. Enter silicone! Any kind of oil won’t mix in with water based paints, so adding an oil or other lubricant to your paint can help the layers separate and slide against each other. That’s a perfect recipe for cells! You will most likely be able to create at least some cells just by adding the oil to your paint without even needing to torch it. These are common in hardware stores and home tool sheds. Brands include Blaster, Liquid Wrench, and CRC Heavy Duty, or even the version of WD-40 that contains silicone (but not the regular one in the blue can, which is silicone-free). These can be inexpensive, and most folks have something along these lines lying around the house to experiment with. You can use all of these straight from the can by spraying them directly into the cups as you mix your paint. However, we prefer to spray the oil into a separate bottle or a container with a lid and then add it to the paints with a dropper. It’s more accurate and less likely to make a mess. Do your spraying outside to avoid the fumes! Once you have a small dishful, you can mix some into your next pour to try out the effect. The downside of spray lubricants is that they contain other chemicals and mystery ingredients besides silicone. They also smell really bad, leave many people feeling dizzy, and have a slightly yellow coloring to them, which will definitely be visible in your pieces. You can use these in a pinch, and many of us start out this way, but it’s preferable to upgrade to a pure liquid silicone oil. Liquid silicone oils are what the vast majority of us use to create stunning cells. We recommend treadmill belt lubricant because it’s 100 percent silicone oil with nothing else added. It’s completely clear, doesn’t smell bad like the sprays, and usually comes in a convenient dropper bottle, making it easy to dispense the right amount into your paints. You can certainly find other products in this category, since silicone oil is used to maintain everything from locks to sewing machines. Just be sure to choose 100 percent silicone. You don’t want any additives or mystery ingredients to throw off your pours by discoloring or reacting with the paints. One hundred percent silicone will be perfectly clear without any coloration, clouding, or inconsistency. Dimethicone is a skin-friendly form of silicone oil commonly found in hair care products and also sometimes in personal lubricants. It usually doesn’t have any smell. You can buy a hair product rich in dimethicone to use, or better yet, buy the pure product to use in your paints. As with silicone, you want to steer clear of any mystery ingredients or compounds that might throw off your paint colors. We’ve had good results with the Coconut Milk Hair Serum, and we have a video here showing it being used. You might also want to consider the KY True Feel personal lubricant. There’s a video reviewing and testing this one here. While we’d consider dimethicone products to be on par with silicone for creating cells, some folks swear that they give them larger cells. As always, be prepared to experiment with different options and see which works best with your paint recipe. It’s also worth considering that dimethicone tends to be pricier than silicone. Silicone is sold cheaply and in bulk, because it’s generally used for maintenance tasks. If being able to work without gloves is important to you, dimethicone is probably worth the extra cost. If not, stick with silicone. You can find personal lubricants in the pharmacy or in the supermarket near the women’s hygiene products. The best way to go, though, is to buy them online to save your blushes at the store! Look for silicone-based lube, or products where dimethicone is used instead. Just make sure that silicone or dimethicone is the first or only ingredient. Can’t I Just Use Water? Most pouraholics will tell you that you really need to use an additive to create the best cells. While there are some painters who claim to be able to create nice big cells using just paint and water, many of these folks water down their paints very thinly to get their results. Using a lot of water can make the materials hard to control, so that the finished pieces are as much a result of chance as technique. They’re also prone to cracking or crazing when the watered-down paint dries. For reasons we explain in our guide to pouring mediums, these watery mixes are much more likely to flake and come away from your painting in the long term. Stick to using a pouring medium and a silicone additive for the best results! The surest way to create beautiful cells, depth, and movement in your painting is to use additives. A lot of new artists think they can use common cooking oils. That’s fairly logical: You’ve heard that a certain type of oil is used to make cells, so why not grab the olive oil or coconut oil from your kitchen? Not so fast. These oils are much too heavy to create cells on the surface of your pieces. They’ll also go rancid over time because they contain organic ingredients. But what about other oils like baby oil? Some painters have used it and reported that it did create small cells for them—but they also said it was very greasy and made the paint too runny to work with. If you have oils from the beauty aisle like this at home that you want to try, give it a go. Often, no one answer is right for everyone. Give these sort of products a quick test and see if you get the results you’re looking for. You just might be lucky. Still, most folks will prefer to stick with silicone or dimethicone. Isn’t Alcohol Good for Cells? You can see Deby’s YouTube playlist for experiments with alcohol to learn more about her results. So, How Much Silicone do You Need to Add? You might like to add the lubricant to all of your colors or only some. Experiment with side by side tests and see how it affects your pour. To Torch, or Not to Torch? Air bubbles are heated, come to the surface, and pop, so when your painting drys, you won’t end up with holes and defects in the paint (fingers crossed!). If you’re going for fewer, larger cells, you may not want to torch. You’ll also find that using a good amount of Floetrol in your mix helps level the materials, so that torching isn’t as important. Still, you should definitely have a torch in your toolbox! Remember, the products above are the ones we use and recommend, but there are no rules with acrylic pouring. If you have a light oil product at home that you think might work, give it a try. And don’t forget to let us know how it goes! Better still, share a video of your process and results with our Facebook group. If you’ve tried some of the products listed above and have a preference about any of them, we would love your feedback! Did you find dimethicone gave you bigger cells? Do you prefer using a particular spray over pure liquid oil? Which has worked best to give you some interesting cells in your pours, and how exactly do you use them for the best results? Please leave us your comments and advice for other pourers below. You can also let us know if you think we’ve missed something above. If there’s a question we haven’t answered or a topic you wish we’d covered, leave us a comment below! I wanted to try and make cells and we had an old can of WD40 in the garage, try as I might I couldn’t get any cells. Then I read the can and found it to be “silicone free”!!! I later got some hair oil and I’m finally starting to get cells. Please watch out for the “silicone free” type of WD40. Do you have to wash off the silicone residue after the painting has cured and before you add a protective coat? I have caught little hints of this on some YouTube videos but no clear instructions. (Related: How long do you have to wait before you can paint over a painting you don’t want to keep? Thank you for all tyke god information! do you have to use a torch? I got some pantene shampoo someone left in my guest bath. It is giving cells like crazy!